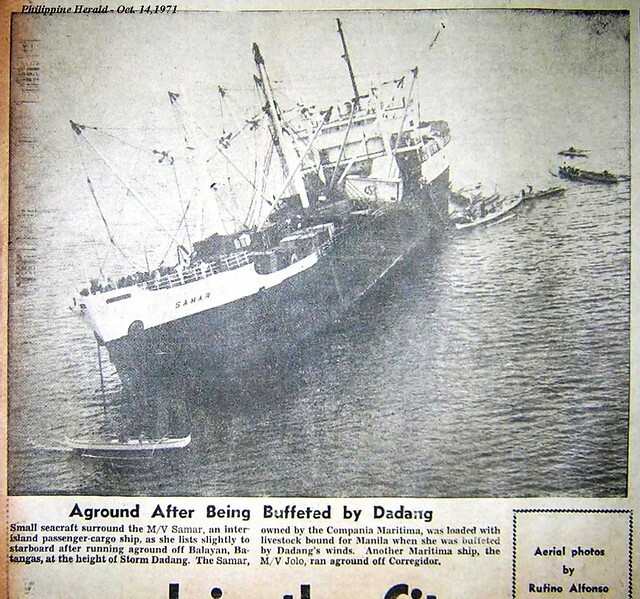 Many people when talking of the Princess of Negros which arrived in 1992 think she was the second Princess of Negros after the Princess of Negros which which arrived from Hongkong brand-new in 1962 and which did the Bacolod-Iloilo route. However, there was a prewar Princess of Negros which also arrived brand-new from Hongkong in 1933 which also did the Bacolod-Iloilo route and she was actually the first Princess of Negros and making the Princess of Negros that arrived in 1992 as the third Princess of Negros. Many do not remember now the first Princess of Negros because she was captured by the Japanese military in 1942 during the Pacific War, pressed into their service and was bombed and sank by US warplanes in 1944. 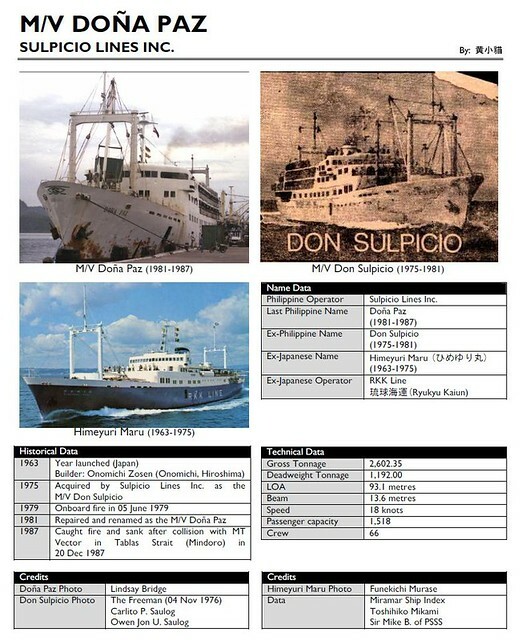 The third Princess of Negros was much bigger than the first two Princess of Negros ships as she was a RORO liner whereas the first two were short-distance cruisers. 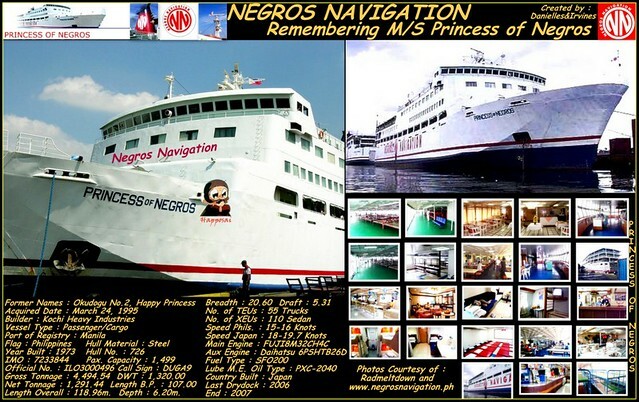 When the third Princess of Negros arrived, she became the flagship of Negros Navigation Inc. 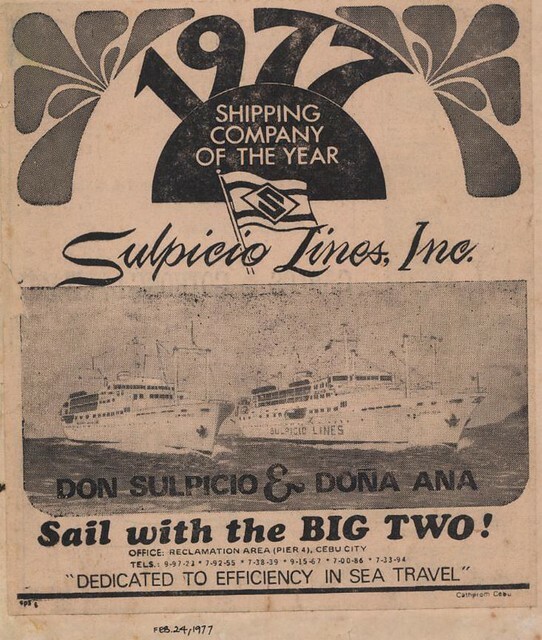 Her routes then were only to Bacolod and Iloilo from Manila as Negros Navigation then still basically served Western Visayas ports plus the port of Cagayan de Oro. When the third Princess of Negros arrived in 1992 she joined her sister ship in the Negros Navigation fleet which was the Sta. 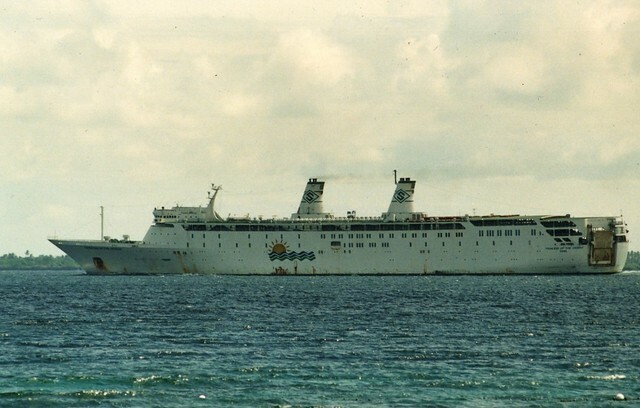 Florentina which arrived for Negros Navigation much earlier in 1983. The Sta. Florentina was the Okudogo in Japan while the third Princess of Negros was the Okudogo No. 2. Their Japan owners was the Kurushima Dock. No, the sister ships were not built in Shin Kurushima Dockyard. Before, a shipyard in Japan can also operate ferries as a prop to the shipping industry. The sister ships were actually built by Shin Kochi Jyuko Company in Kochi, Japan. Okudogo No. 2, the latter Princess of Negros was completed in July of 1973 and given the ID IMO 7323310. She was a RORO ferry with the dimensions 118.9 meters by 20.6 meters with a gross register tonnage (GRT) of 4,700 as built. Her load capacity was 1,664 in deadweight tons (DWT). 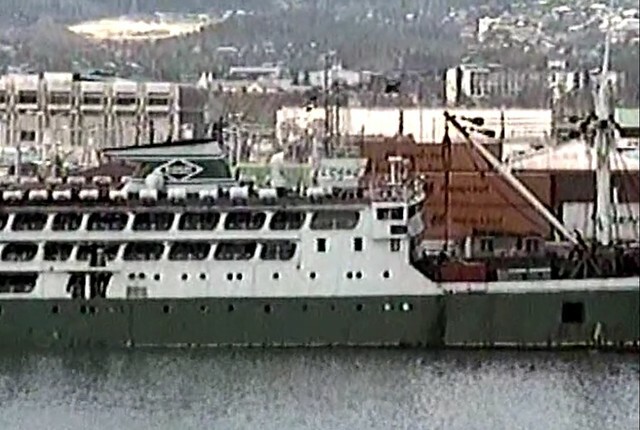 This RORO had bow and stern ramps as access and the visor bow ramps continued to be operational here when most RORO liners had those welded shut. The ship had a raked stem and a transom stern. She had two masts, a single center funnel and later full scantling unlike her sister ship Sta. Florentina. The time she was fielded was already the peak of ship passenger demand and big passenger capacities were needed. The ship had three full decks dedicated to the passenger accommodations (but not at the start) and her passenger capacity across six classes was 1,499 persons. Later, this even rose to 2,002 persons when full scantling were built on the ship. A significant portion of her accommodations was dedicated to ever-so-on-demand Economy section which occupied the sterns of the three passenger decks. The higher classes as well as the restaurants were on the forward sections of that. The bridge deck of the ship was exclusive for navigation and for the accommodation of the crew. The third Princess of Negros had a single car deck that had about 400 lane-meters. She carried TEU and XEU container vans both mounted on chassis and not and also a few vehicles. Her actual declared capacity was 100 TEU. In the Philippines the third Princess of Negros had only 4,494 in gross tonnage (GT) and 1,291 in net tonnage (NT), a violation of the IMO rule that the net tonnage of a ship cannot be less than 1/3 of its gross tonnage. It is certainly an underestimation given she has full scantling. Her sister ship Sta. Florentina had 1,518 in net tonnage and it had no full scantling. The design top speed of the Okudogo No. 2 was 18.5 knots and that comes from 4 Fuji 8M32CH4C engines that develops 10,400 horsepower which is the same powerplant of her sister ship. In the Philippines as the Princess of Negros she usually cruised at 17 knots which was good for a 20-hour transit time to Bacolod or Iloilo. 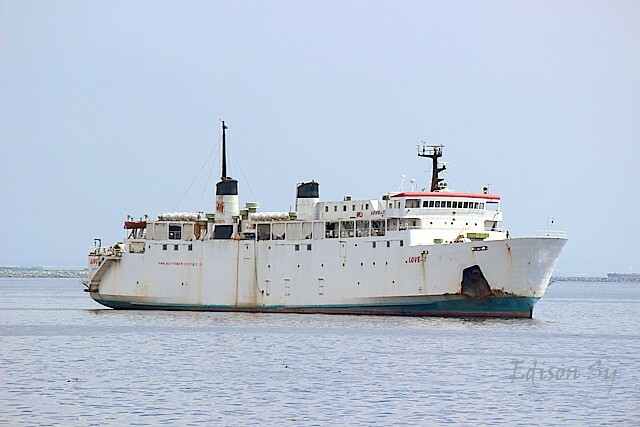 In 1994 she was displaced as the flagship by the beautiful and sleek St. Francis of Assisi but she continued doing the Bacolod and Iloilo routes. 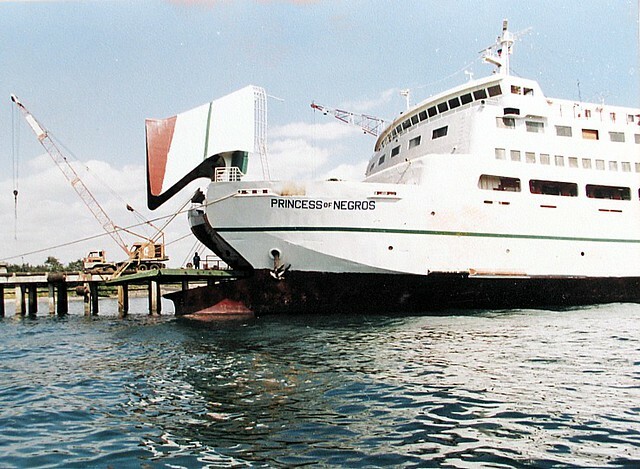 When Negros Navigation began its big expansion program starting in 1995 when Negros Navigation acquired six more bigger and faster liners in a span of just over two years, Princess of Negros no longer did the exclusive Bacolod and Iloilo routes. 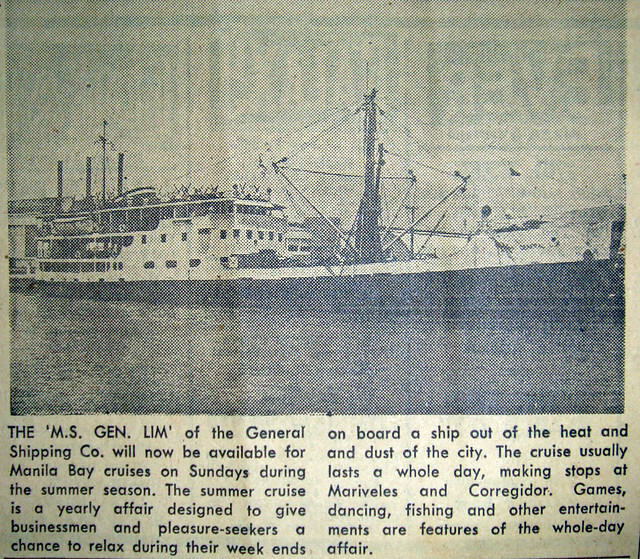 First, she was sent to the long Cagayan de Oro route in pair with the Sta. Ana. A little later, she was already doing the Roxas City route and in that time she was the best ship in that route. With the entry of the new millennium, the over-expansion of Negros Navigation bit hard and the company was hit by illiquidity and shipyards and suppliers filed suits of garnishment. After that, the ships of Negros Navigation were barely sailing. They did not sink completely, however, as a white knight in the person of Manny V. Pangilinan appeared. 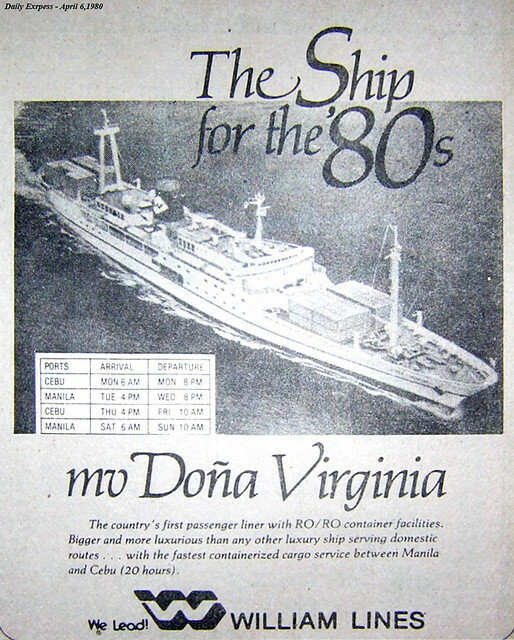 However, in the restructuring, routes were cut and many of the RORO liners of Negros Navigation were offered for sale. During that time there was already a crisis in the liner sector as the passengers had already began drifting to the intermodal buses and budget airlines. Panay island liners were hit hard when the Roxas, Oriental Mindoro to Caticlan, Malay, Aklan route opened in late 2003. Very soon, intermodal trucks and buses began rolling to Panay island and immediately most hit were the ports and ships going to northern and western Panay island ports. The third Princess of Negros was laid up in Manila and for about two years she was appearing in ship-for-sale sites. There were no takers, however, and on 2007 she sailed to Bangladesh when she was bought by Chittagong breakers. She was eventually broken up on April 6, 2007 when she was still a good and reliable ship. She served just a little over a decade in the Philippines.